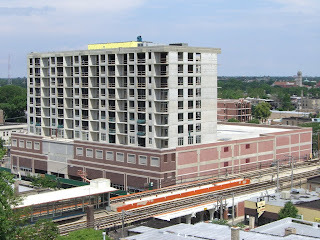 "The Granville" Is Coming Along Reviewed by Edgeville Buzz on July 8, 2008 . 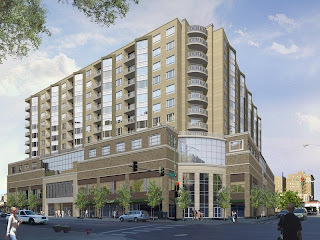 Here’s an architectural rendering and recent photo (7/4/08) of The Granville, which is going up at the northeast corner of Granville and Broadway. The condo building is 12 stories and will include 160 units, some of which will reportedly be CPAN units (Chicago Partnership for Affordable Neighborhoods). There will be a Staples store as the anchor on the ground floor, though many people were hoping to see a Trader Joe’s occupy that space. Apparently the developers are currently looking for other retail/restaurant tenants. If anyone has got more concrete information on The Granville, please let us know!